Pretty in pink, not just a movie…. this cake is so full of delicious flavor. 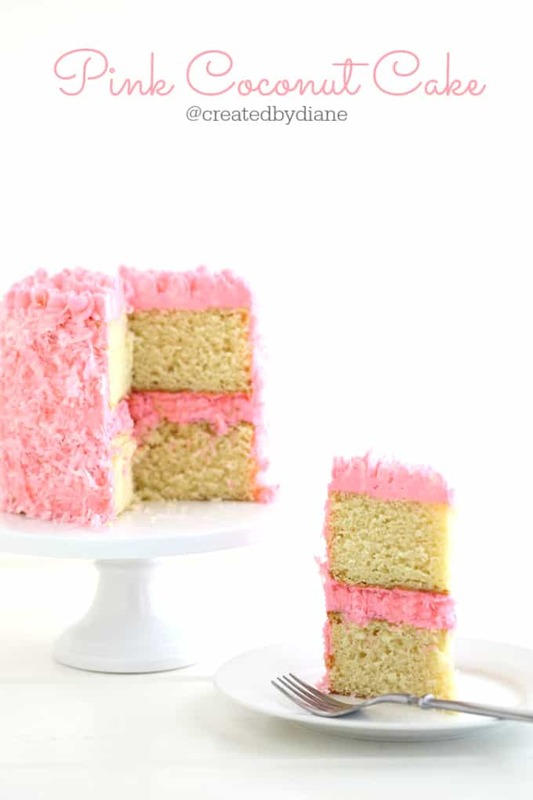 Inside is two layers of delicious vanilla-coconut cake, with pretty pink coconut frosting mixed in with coconut in the center and more coconut frosting on the outside as you can see, lots of coconut. Pretty pink coconut to be specific! I’m a coconut fan through and through, even if you or someone you know isn’t this would win you over. Those who could easily pass up coconut, I can’t relate I secretly refer to all non-coconut lovers as CRAZY! 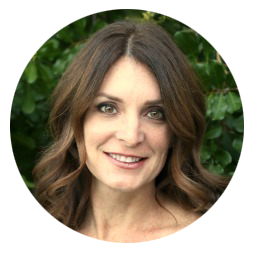 Oops… not a secret anymore! This cake somewhat reminds me of the “snowballs” from Hostess I recall having as a kid but this isn’t chocolate. I really wanted a nice vanilla and coconut blend for this cake and the coconut flavor I used is one of the most delicious. I use LorAnns Coconut Baking Emulsion. Coloring coconut is so fun! It becomes something new in seconds, right in front of your eyes. It can be made in just about any color you’d like. 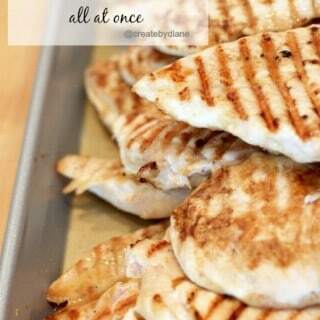 You can perfectly match is to all your baking needs. 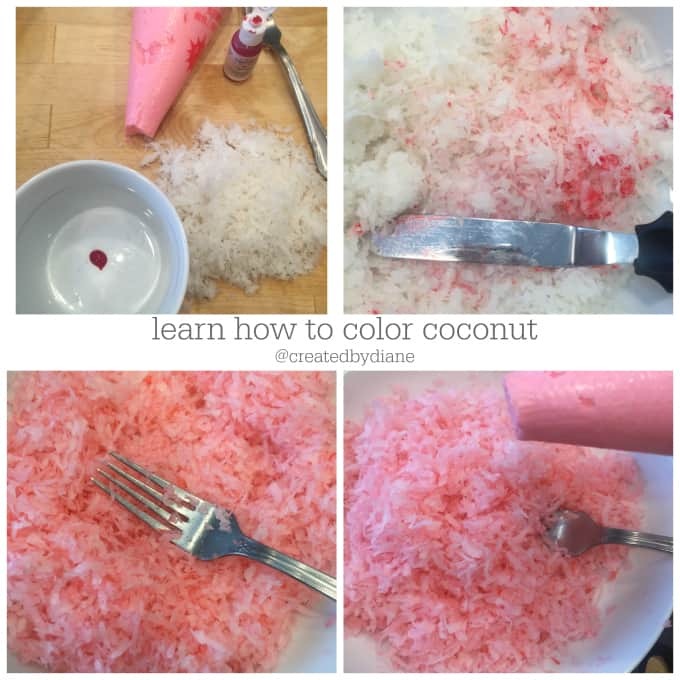 With just a few drops of food coloring and a fork, you’ll have a super fun color coconut. I prefer gel food coloring, it doesn’t add any water to the coconut so it won’t be soggy. Sweetened coconut is already moist so the gel coloring spreads easily to coat the coconut without making it clump together, it will still look flakey. 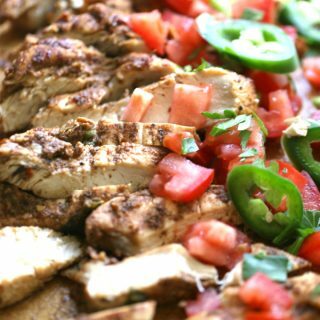 Add a drop or two at a time of the desired color and mix with a fork until the color is completely blended, if the color is too dark, add more coconut. I matched the coconut to the frosting color and blended until it was an exact match. Store any extra coconut in an airtight container. I prepared one 14oz bag of shredded sweetened coconut for this cake and had some 1/2 cup or so left over, it didn’t go to waste it was yummy over ice cream. 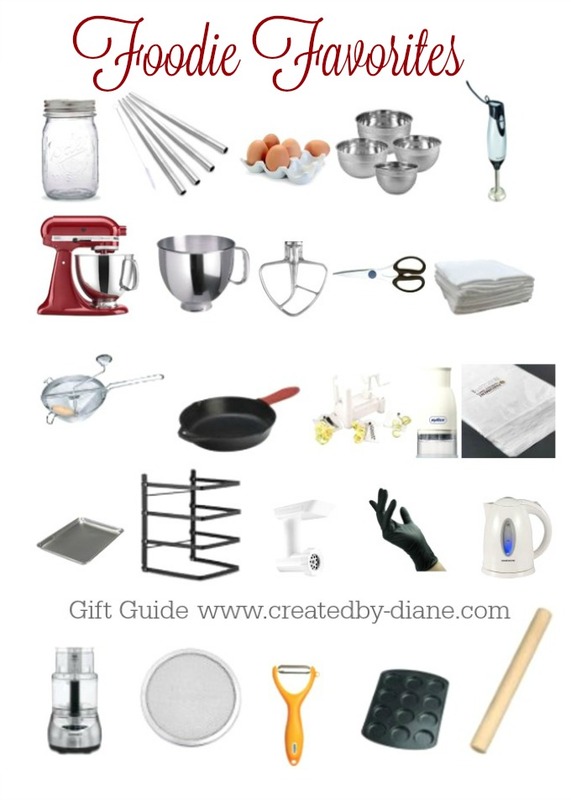 This recipe makes 2 6″ cakes and 6 cupcakes. 6-inch cakes are my favorite, I just love the size of the finished cake. 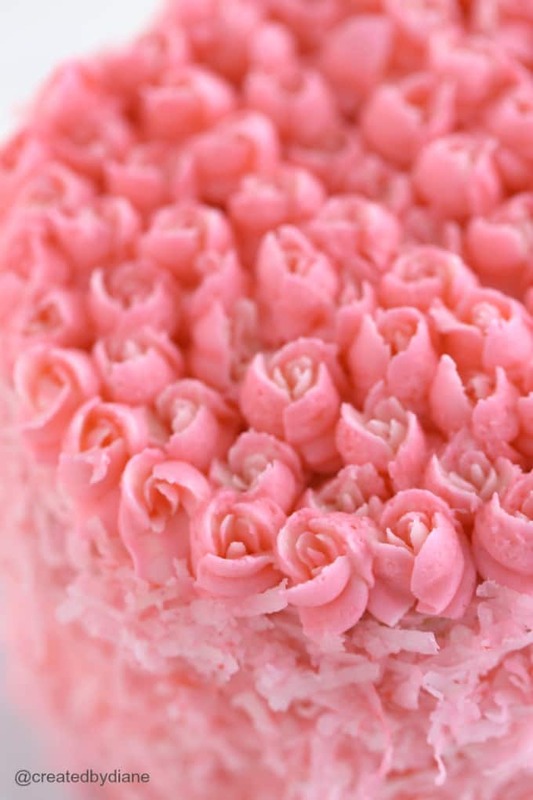 Take a look HERE to see a video on how to frost the mini roses! Mix in flour, baking powder, milk, butter, oil, vanilla and coconut flavors on medium to medium-low until completely combined. This recipe makes 2 6" cakes plus 6 cupcakes. Use a baking spray to coat the cake pans and paper liners for the cupcakes. Place 2 cups of batter into each 6-inch cake pan. Test with a toothpick, place the toothpick into the center of the cake and cupcakes and it should come out nearly clean. Wrap and freeze cakes for 4 hours to overnight. Remove the cakes from the freezer and unwrap. Stack up the two cakes, placing some frosting and coconut in the center of the layers. and press the pink coconut into it. Pipe the roses on top. In mixer bowl beat butter and shortening until whipped smooth. Add in powdered sugar and heavy cream and mix on low to combine, then turn on medium to blend. Remove ½ cup of white frosting if you want two tone roses. 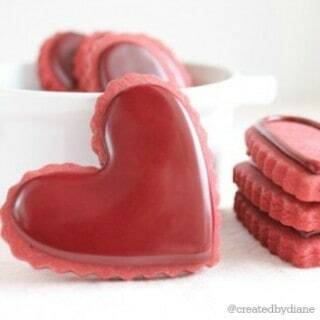 Then add the pink food coloring to the remaining frosting and mix until creamy. After the cakes are baked allow them to cool completely, then wrap and freeze them 4 hours to overnight. It helps to create a firm cake that doesn’t fall apart and crumble once the knife cuts into it. I find it also keeps the cake moist. Stack up the two cakes filling the center with frosting and pink coconut (or just frosting if you prefer), then spread about a 1/2 cup frosting over the cake thinly and smooth it out. 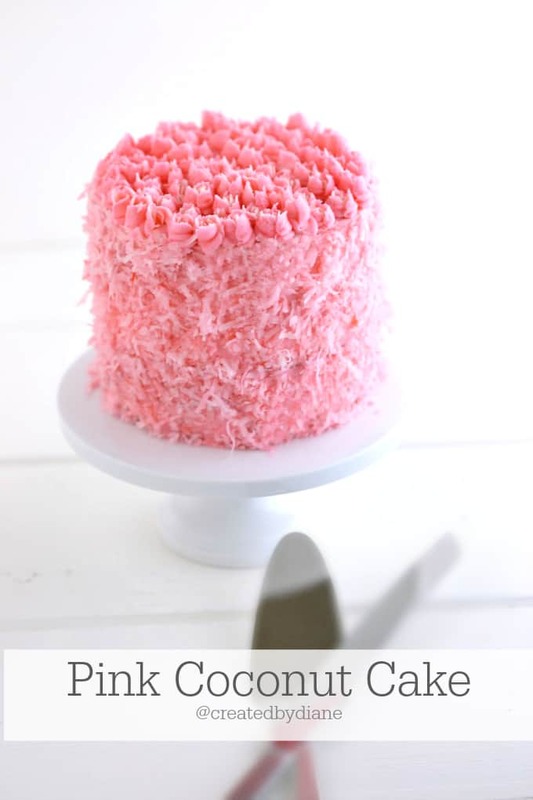 Then place the cake in the fridge to chill to set up, this will make it easier to spread the remaining frosting on the outside and press the pink coconut into it. Pipe the roses on top. Can you tell the roses are not all pink… that was done on purpose, they have white centers. I think they match the coconut so well, it’s easy to do too. In a piping bag spread pink frosting all on the outside of the bag, and place the white frosting in the center of the piping bag, that is how the roses got their white centers. You don’t need to be totally neat, the frosting will blend together, but if the white is in the center of the piping bag, it will be in the center when you pipe it out. Pipe the roses on top of the cake. 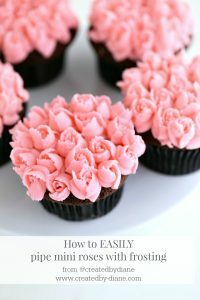 HERE you will find my post How to easily pipe mini roses with frosting. Place the cake in the fridge to firm up the frosting. 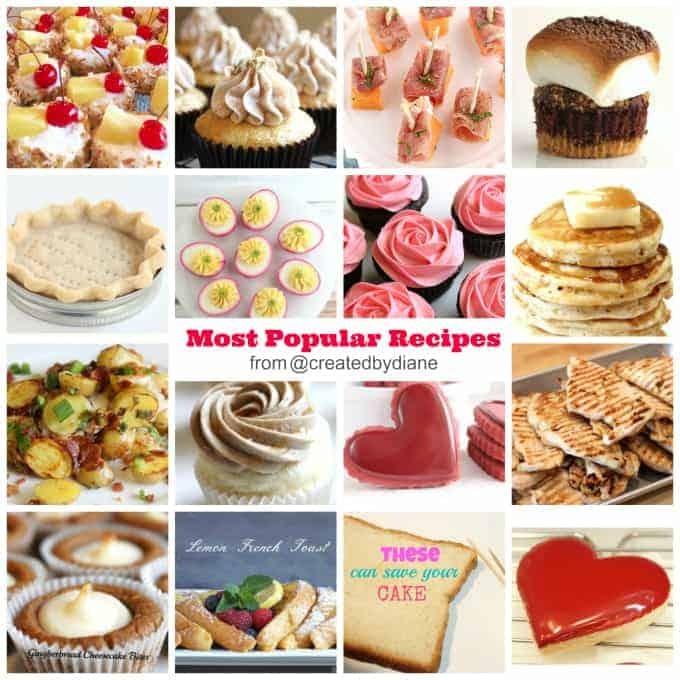 Allow cake to come to room temperature before serving for best flavor. 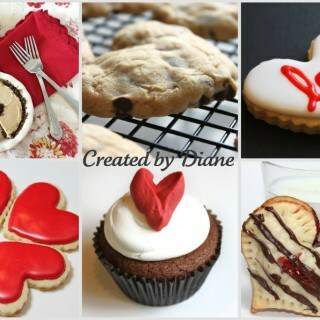 Well Just made this for myself and love it. Thanks so much!